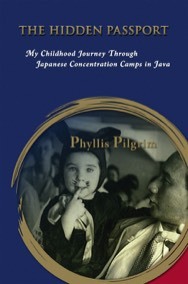 In The Hidden Passport, Phyllis tells of her childhood experiences from five to nine years old, when she was interned as a prisoner of war during WWII in Java with her mother and brother in Japanese internment camps for women and children. It is the story of survival, courage, and insights of daily life in captivity, laced with humor. The whole family survived. In the memoir, Phyllis also describes how these early experiences shaped her adult life and career choices. Click HERE to read Dan’s lovely homage to Phyllis and The Hidden Passport.